A large art quilt for sale. Wonky shapes randomly placed, irregular gold strips among navy. An abstract art quilt wall hanging, the bold color has gold metallic highlights. The colors are fuchsia, teal gold. Original art . A contemporary art quilt in an impressionist style .Free shipping .Silk painted dogwood blossoms. Announcement You may notice that I'm passionate about art! As an artist for most of my life, I hope you can sense my joy and motivation in creating my work. I think my enthusiasm fires the kind of art quilts I love to create. I hope it can touch your own love of original art. Original art can bring years of enjoyment! You may notice that I'm passionate about art! As an artist for most of my life, I hope you can sense my joy and motivation in creating my work. I think my enthusiasm fires the kind of art quilts I love to create. I hope it can touch your own love of original art. Original art can bring years of enjoyment! A contemporary art quilt. Bright abstract sprial in blue, peach and purple. A large art quilt for sale in the BoHo stye. This is a silk painting of beautiful pink cherry blossoms set against a deep blue sky. A contemporary art quilt. It features stylized dogwood blossoms. A contremporary art quilt for sale. Free Shipping. Reasonably priced for original art Geometric in blue and Golf. 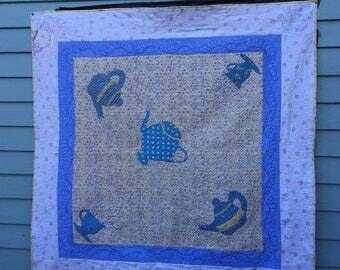 A tea party quilt, could be a table topper or a little girl's keepsake quilt. Appliqued tea pots and cups, blue and yellow. An art quilt for sale. Fiber art wall quilt in a geometric abstract style. Striking purple and gold colors. Gorgeous Celtic silk painting of the finest art! A art quilt silk painting. it has outstanding art quilting in teal green. A unique, stunning piece of art! An art quilt for sale, unique silk painting, tree silhouetted by moonlight. Mounted on stretcher boards. A detailed view of a silk painting, mounted on stretcher boards. Stylized white flowers. A large art quilt for sale, contemporary wall hanging mounted on stretcher boards, green blue. This art quilt was inspired by a photo I took one night of an unusually lite moon. I often use my photos to inspire. Working on a commissioned art quilt. I added a few baskets to corral my tools and immediate supplies, yet keep them in reach. I often use my photos for inspiration. This quilt,"Moon Glow" came from a photo I took one night of an unusual moon. I love the process of creating, following the progress of an art quilt to see where it leads. I’m a fiber artist, I create original fiber art quilts and silk paintings, working in mixed media. art quilting, it was a natural transition, I have been a painter my whole life and I am able to use those skills in many of my art quilts. When I’m struck by an image or thought that excites me, a tiny seed of an idea forms, vague and blurred around the edges. I simply follow where that leads me. I work instinctively, with little advanced planning. As each need for a creative decision arises, I make the choices based on what feels right at the time. This creates many changes in the direction that the quilt takes. There are many twists and turns along the way. The-- results can be surprising. I love that element of surprise! Sometimes everything just comes together and something special happens that exceeds my expectations. As I’m standing back looking at the finished piece, I’m thinking that this is one of my better ones. And I’m smiling like the Cheshire cat, pleased as punch with myself. Honestly, I’m like a 6-year old, running home from school with a drawing in hand to show Mom.